I was out having dinner with my friend Minna tonight at a local hipster sushi bar when I suddenly had a intense craving for raw, crunchy seaweed. There was a definite need for something spicy, salty, and seaweed-y between our copious orders of raw fish and beer. Unfortunately for me, nothing on the menu fit the bill, so as soon as dinner was over, I got to work on satisfying my primal seavegetable urges. 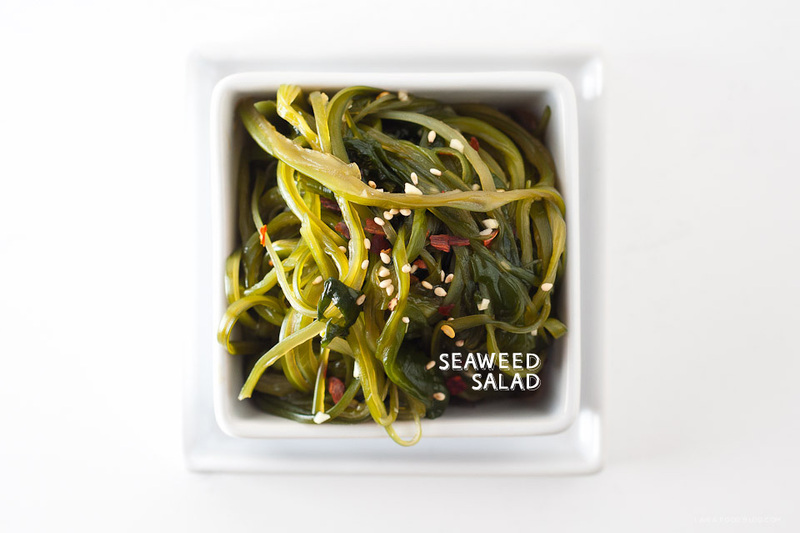 It’s hard to believe but there used to be a time when seaweed wasn’t a commonly eaten food. At one point, seaweed was just that: weeds of the sea. I wouldn’t say it’s super-popular now, but it’s definitely come a long way. 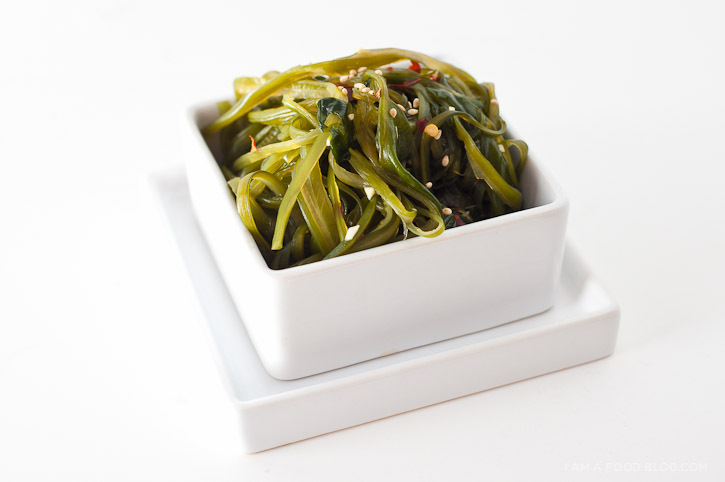 Crunchy and gelatinous, this seaweed salad is refreshing and hearty with a light Japanese inspired dressing. 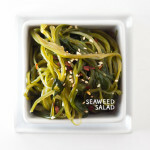 I am salty, I am from the sea: I AM SEAWEED SALAD! Rinse your seaweed in cold water for 15 minutes. Soak in cold water for as long as you can possibly wait and then some. Make sure you rinse the seaweed again before using it. Brown seaweed stems come packed in salt and if you don’t rinse or soak you’ll have an over salted salad. Mix together the dressing ingredients. Toss with the seaweed. Enjoy! This is really delicious, I made a few changes for the sake of time and supplies. I used roasted seaweed (type to make sushi) and cut them into strips. 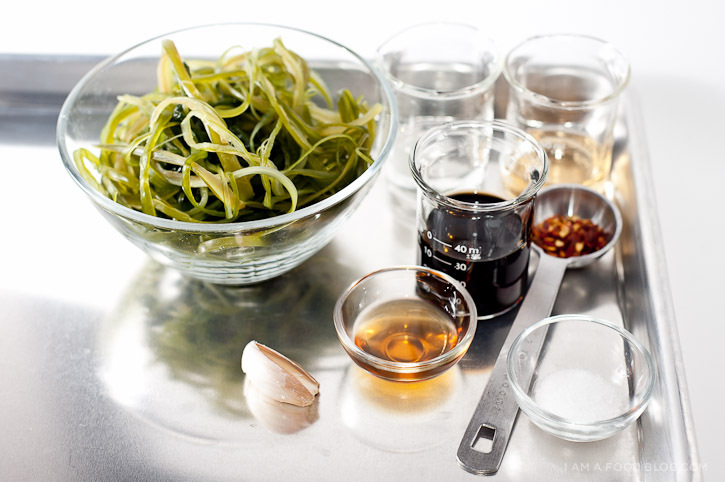 Used low-sodium soy sauce, mirin, sesame seeds, garlic-chili sauce, half a lime, garlic, and ginger. Delicious. I also added conch, cucumbers, and tomatoes to my salad, so I could get protein and stuff. Next time when I have the supplies I will actually make this to the T. Thanks for sharing! You have some yummy-looking recipes! This is one that I could eat! (I am basically eating starch-free, and finding it can be as much fun as many of the recipes with starch!) Keep up the good work of providing appetizing and tantalizing suggestions for people to add to their recipe boxes — and to their dining pleasure! I’ve been looking for a recipe for a while and stumbled upon yours! I love your blog – totally following now! The recipe on the back of the bag suggested shredding carrots and cucumber slightly salting and adding to rinsed seaweed. I did carrots only. It also suggested copious rinsing then a few seconds of parboiling. I think I’ll skip the parboiling as it seemed to remove some of the crunchiness. No garlic or pepper in this recipe, had grated fresh ginger which i liked. I did not add saki. Nest time will not parboil, try garlic and add toasted sesame seeds which are somewhere but can’t be found. The rest is much the same as above recipe. So glad I found your blog . I was craving that mysterious sushi bar seaweed salad. BUT if u google it you’ll get recipes that don’t come near this one . The key is actually finding the right seaweed ! Other blogs gave up on their search and just settled for the next best thing . 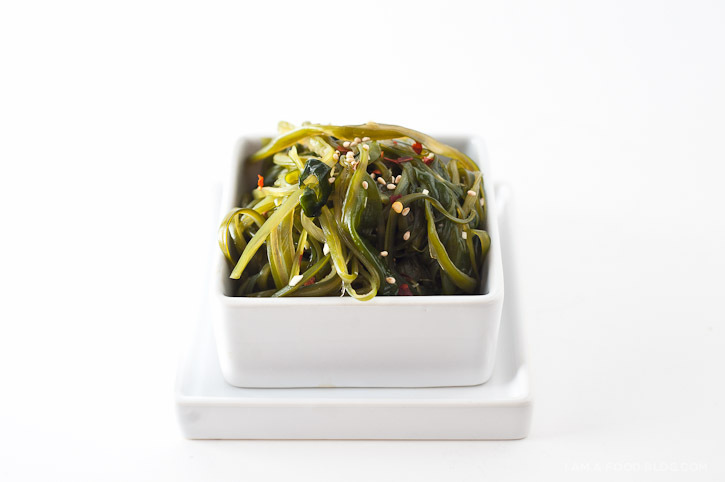 I’m writing this as I’m eating my delicious seaweed stems I found at my local Korean market . !!!! Yum yum yum . Thanks ! hi sukhy, which type of seaweed did you purchase? Thanks for this. I found it on sale at 99ranch and couldn’t remember the recipe to save my life. I appreciate you.